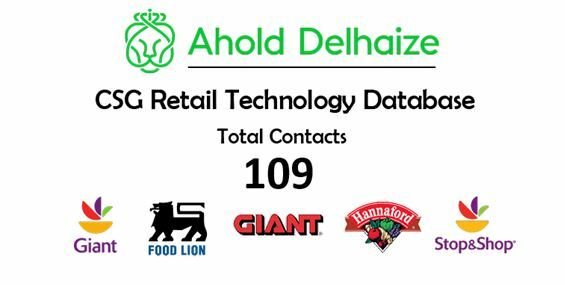 While the Kroger-Ocado tech deal garnered a ton of attention in recent weeks, Ahold Delhaize USA, a subsidiary of 10th largest supermarket group in the world, also made a significant move to compete in the digital space. The company announced the formation of Peapod Digital Labs, a new entity that seeks to drive digital and e-commerce innovation and technology for the company and its customers at 2,000 US supermarkets under the Stop & Shop, Food Lion, Giant, Hannaford, and Giant/Martin’s banners. To head up the organization, the company promoted JJ Fleeman to serve as President of Peapod Digital Labs and Chief E-commerce Officer of Ahold Delhaize USA. Peapod, founded in 1989 and acquired by Ahold in 2000, is the company’s branded online grocery delivery service. If it’s your business to know and connect with technology teams within grocery and supermarket chains, CSG’s Retail Technology Database can help.